According to recent reports and scientific studies, researchers have uncovered a possible link between the use of talcum powder products and the subsequent development of cancer, including ovarian cancer in women. Despite its sweet aroma and soft feel, talcum powder is considered by many leading scientists to be one of the most controversial products on the market today. In fact, researchers and doctors have been warning the Food and Drug Administration (FDA) as to the carcinogenic propensities of these products for years. Nonetheless, the FDA has not mandated placement of a warning label on talcum powder products, nor has it opted to issue a warning statement or communication to consumers about the possible risks of using this product. Talcum powder is derived from the soft-to-the-touch mineral known as talc, which is mined in areas all over the world. To make talcum powder, the talc mineral is finely ground along with several other components, including a mixture known as hydrous magnesium silicate. In its most natural form, the talc mineral may contain traces of asbestos – a carcinogen widely-known to cause respiratory disorders including mesothelioma. Some researchers have likened the effects of modern talcum powder to asbestos, claiming its ability to travel through the body and induce cancer-causing inflammation. Talcum powder is used in a wide range of health, beauty, hygiene and cleaning products. The most widely-known products containing talcum powder include makeup, deodorant, after-shower freshening products, foot powder and baby powder. Alarmingly, talcum powder products appear on nearly every shelf in the local drugstore, and the widespread use of these common household products has prompted many to seriously consider the true extent of talc’s association with cancer. In addition to widespread use in hygiene and beauty products, talc is also used in certain paints, crayons, art supplies, soap, appliances, papers, plastics and ceramics. Probably one of the most well-known manufacturers of talcum powder, Johnson & Johnson has been selling products containing talc for decades. Its baby powder product has been a changing table staple for generations, as talcum powder is generally known for its ability to reduce moisture and friction – common suspects in diaper rashes. Johnson and Johnson remains a household name for over-the-counter products and has been in business since 1886. Unfortunately, Johnson & Johnson is not a stranger to litigation, particularly with regard to its over-the-counter products. One of its most popular products, Tylenol, has been recalled several times – for a varied number of reasons. With regard to its prescription medications and medical devices, Johnson & Johnson has faced thousands of lawsuits by plaintiffs citing the company failed to warn them of serious dangers associated with its product. One recent settlement involving the anti-psychotic drug Risperdal has resulted in a $2.2 billion payout by the company following allegations it lied about the serious risks linked with the drug. Johnson & Johnson has also faced lawsuits surrounding its hip replacement products, cardiac devices and various allegations involving unlawful marketing techniques. According to several published studies, women who used talcum powder for personal hygiene – particularly perineum care – are up to 30 percent more likely to develop ovarian cancer than those who have not used the product. This statistic begs the question: If so many women are being injured by this product, why is it still on the market? Talcum powder lawsuits against talc manufacturers are cropping up across the United States, citing an unlawful failure to warn consumers that the product carries an unreasonably high risk of causing potentially fatal cancer. 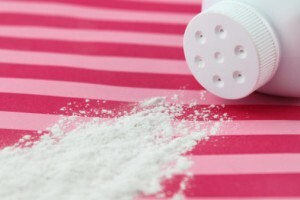 Under the laws of negligence, a plaintiff may be successful in filing a talcum powder lawsuit if she can establish that the manufacturer knew, or should have known, that the product was unreasonably dangerous and not only failed to warn the consumer, but continued to market the product as safe nonetheless. These types of allegations are not without defense, and conglomerates like Johnson & Johnson often waste little time devising ways to avoid liability. One way for a product manufacturer to avoid liability in certain situations is to claim it did not know, or have reason to know, that its product was dangerous. In the context of talc cancer lawsuits, this defense is unlikely to succeed as the FDA has been warned about the potentially deadly nature of talcum powder for decades. Another common defense to a baby powder lawsuit is lack of causation. In other words, there is no way to definitively prove that the talcum powder actually caused the resulting ovarian cancer (i.e., the victim was pre-disposed to cancer, or the cancer was caused by another source). Talcum powder ovarian cancer lawsuits are emerging in dozens of U.S. jurisdictions, and several have proven successful already. For instance, a jury in South Dakota recently awarded a sizable verdict against the manufacturers of “Shower to Shower,” concluding that the manufacturer knew of the risk of ovarian cancer associated with talcum powder and failed to warn consumers of the potential for developing the condition.